Johnny Bulun Bulun was born in 1946 just after the Second World War near the Arafura Swamp of Central Arnhem Land. When he was older, his family moved to the nearby mission in Milingimbi so that he could attend school. He left school early to work in a variety of labouring jobs on the mission, at the government settlement at Maningrida, and with the Armed Services in Darwin. Johnny was a senior member of the Ganalbingu group and was one of the most important singers and ceremonial men in north-central Arnhem Land. A steady though not prolific painter, he began to make his mark in the late 1970's when the Aboriginal art market expanded and the Art & Craft Centre cooperative at Maningrida began to be noticed. His career took an interesting turn in 1977 after he was commissioned to complete an individual mural on the wall and ceiling of an underground Australian Defence Department installation in Canberra. In 1979, Bulun Bulun produced the first set of limited edition prints by an Aboriginal artist at Melbourne's Port Jackson Press. And in 1981 his importance was recognised by a solo show at the Hogarth Gallery in Sydney. His major painted totems were Gumang, the magpie goose and Guwaynang, the long necked turtle usually shown around a central sacred waterhole. The Guwaynang was Bulun Bulun's personal totem. “It is the most important one because it was him that made my country and my people”, he said. Other common subjects in his art were Garjarr, the water snake amongst waterlilies in the swamp country, the Dreaming figure Yangagai, Wamyu the flying fox, Gunungurr, the blackheaded python, and Diljidamba, a brown water beetle eaten by the tortoises. John Bulun Bulun was also a respected traditional doctor, songman and senior ceremonial manager. His paintings often described the annual visits over more than three hundred years (until 1906) of Macassan traders to Arnhem Land shores to collect and process trepang (beche de mer) which they traded with the Chinese. His large barks might concentrate on the most important abstract and figurative elements of the Ganalbingu language group creation myth but also contain references to the social and cultural influences absorbed through interaction with Macassan people. Abstract designs on individual barks comment on the path of the Macassar praus journeying to and from ‘Marege’, the name they gave to Australia's Arnhemland. The North West wind that carried them is represented by a triangular pattern which is also painted on the bodies of dancers performing in ceremonies. Songs and accompanying dances describe some of the goods which were introduced by the Macassans such as tools, dugout canoes and their sails, knives cloth and tobacco. In 1993 Bulun Bulun led a group including dancers, songman and didgeridoo players to perform the Marayarr Murrukunddjeh ceremony over three nights at the Galigo Museum in Macassar (Ujung Pandang), Sulawesi. Bulun Bulun had long dreamed of this land so intimately connected with his people’s past. Elaborate preparations for the ceremony included body painting and decorations and making the Marayarr pole to represent the mast and rigging of a Macassar ship. By painting the pole and making the feathered ropes and singing, this pole, handed down from father to son, had enabled elders to pass on the lore. On the last night of the ceremony, the dancers slowly appeared out of the shadows to reveal their final gift. People mourned the loss of the pole as it was presented, a traditional ritual which reflected the Ganalbingu’s sadness at parting with their Macassan friends and family. Bulun Bulun was also involved in a famous 1998 legal case regarding the copyright of his art and the Ganalbingu people's images and stories. R & T Textiles admitted infringing Bulun Bulun’s copyright by importing and selling fabric on which one of Bulun Bulun’s artworks, Magpie Geese and Water Lilies at the Waterhole, was reproduced. The company consented to declarations to the effect that Bulun Bulun’s legal title to the copyright had been infringed, and agreed to comprehensive permanent injunctions. But the case went on to deny that there was any communal copyright in Australian law for the Ganalbinbgu people. Justice Von Doussa did, however, find that the relationship between Bulun Bulun and the Ganalbingu people was a fiduciary relationship, under which “the artist is required to act in relation to the artwork in the interests of the Ganalbingu people to preserve the integrity of their culture, and ritual knowledge”. In this case, Bulun Bulun had taken appropriate action to enforce the copyright in Magpie Geese and Water Lilies at the Waterhole, and had therefore fulfilled the obligations he owed his tribe. There was therefore no occasion to grant any additional remedy in favour of the Ganalbingu people. 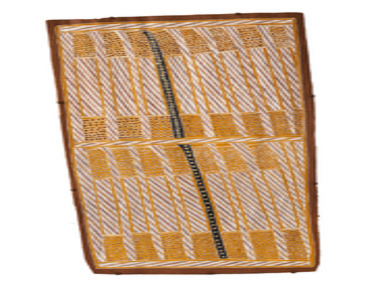 McCulloch's Contemporary Aboriginal Art lists Bulun Bulun at the head of its catalogue of Maningrida artists and reports that he and brother-in-law Jack Wunuwun were both welcoming of and a great influence on the Melbourne artist Lin Onus. Bulun Bulun's last commercial show was at Annandale Galleries in Sydney.